It started with an off hand remark. I feel like I’m on A Prairie Home Companion. And so in 2010, Southport Christian Church (Disciples of Christ) launched The Front Porch Worship Series. Every August they would stir worship into the same pot as old time variety radio shows. A house facade adorned the chancel, complete with porch. It was ingenious, and fun, and the church had just the right combination to pull it off. 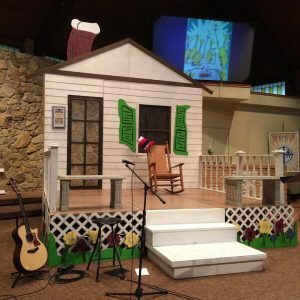 Now, at the conclusion of the ninth season of Front Porch Worship, the time for saying goodbye has come. Southport Christian Church has become Tapestry Church. They have sold the building that has been home to their ministry and will be moving to a new mission field. This Sunday, August 26, will be the last worship service for this community of faith at 201 East Epler Avenue in Indianapolis. It will also mark the end of the Front Porch Worship Series. As one of the originators, as one who loves this community of faith, and as one who has admired the courage it took to start, I consider it a high honor to sit as the featured artist for the closing of Front Porch Worship. The series gave me the opportunity to perform with some truly outstanding musicians while simultaneously stretching the boundaries of worship and proclaiming good news. This particular blessing is the climax of many that have come before. Time passes, and our best moments become the highlight reel of memory. Just one more time, though, we get to do it again. Notes: Dean returns to the Front Porch Worship Series at Southport.